Just minutes from the famous Siesta Key beaches, fabulous restaurants, shopping and entertainment, Saratoga Place could not be in a better location! We are near the best the Gulf Coast has to offer, nestled among lush landscaping and the tree-lined streets of prestigious Palmer Ranch. Living here you can rise to coffee and the morning paper on your private terrace, rejuvenate with a workout in our 24-hour fitness center, or relax by our heated pool and hot tub. We also offer access to the community clubhouse, which features the business center, coffee bar, pool table, card table, and big-screen TV. In addition, the community has a dog park affectionately called “Wiggly Field” and doggie stations. Saratoga Place is within walking distance of the popular Legacy Trail where residents can walk, run, bike, or roller blade your way down this historic trail. But if you rather stay at home, then play at our lighted tennis court, clean your car at our car center, or grill at one of our many grilling stations. 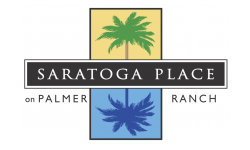 Stop by or call today and see why Saratoga Place is the perfect place to call home!